“This is my first collaboration with a mainstream artiste and an English collaboration with a Punjabi song. 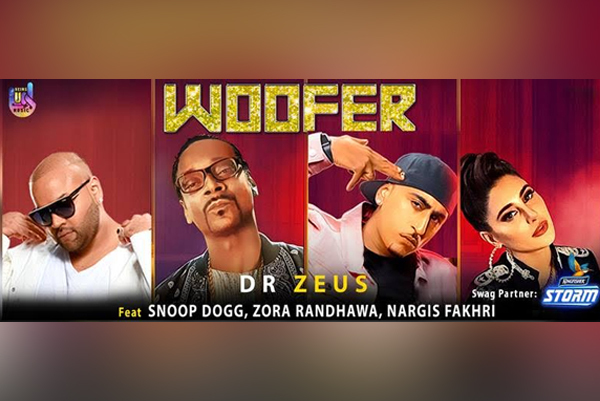 We have Snoop Dogg giving those raps, Nargis Fakhri who has brought that touch of an ‘American culture’. Also, she is a Bollywood actress, she’s originally a queen and she's bringing that queen flavour into it. Then we have Dr Zeus who has got that British culture with Punjabi music banging in. This entire song is a perfect blend of fusion. Just like the way we say ‘Urban desi tadka’. Similarly, we have this song which is a mix of many elements. Woofer is an energetic hip-hop party song. People are really excited, even when we had just put the teaser on we were getting an amazing response,” says Zora. BeingU Music has produced this video. Their main motive is to establish a movement and to popularize Indian music across the globe. Dr Zeus track is a kick start to their goal. “When we met them we just found that we both had the same vision. Zora and I had recorded almost 50 per cent of the song, after which we did not know the way. BeingU Music came at the right time and had the right roadmap in their head. They wanted to create a movement from scratch and I came up with something which was 50 per cent done. The audio was completed and BeingU Music came on board. BeingU Music is now like a family and I can’t thank them enough for their support,” confess Zeus. MUMBAI: With the Gully Boy fever taking over the streets of Mumbai, we would want to introduce you to another rapper in town - Razif, a jovial Uber driver partner from the city. MUMBAI: There is a hint of sarcasm in the melodious rendering of Rahul Ram's new song Chunaav Ka Mahina - a parody of Sawan Ka Mahina from the 1967 film Milan - that hit YouTube recently.